The Red Barn Cadence Weymouth exudes elegance, featuring a subtly shaped noseband and classic Black & Clear crystal browband. 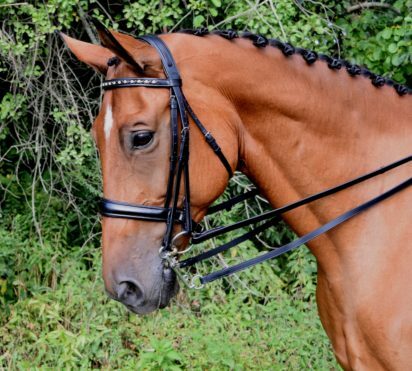 The Cadence Weymouth also features a modernized threaded headstall, padded and contoured, with the bradoon hangers stitched into the crown to allow the soft padding to rest directly on the horse’s poll. 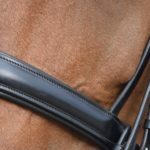 The padded cavesson crank noseband measures 1 1/2″ at its widest and gently tapers down to 1 3/8″ on each side. 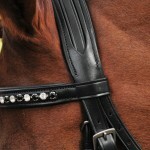 Comes complete with ¾” Dressage Reins (plain leather reins with stops) and 5/8″ Curb Reins. This bridle is made of the best Grade A Sedgwick’s English leather. All hardware is stainless steel, pin end for a cleaner look, with a roller buckle on the noseband.